Ten Frames are an important tool when it comes to building number sense, building a concept of what 10 is and helping students to explore strategies such as composing and decomposing of numbers. Having a solid understanding of ten and being able to visualize the number bonds that make up the number ten, is important for students. 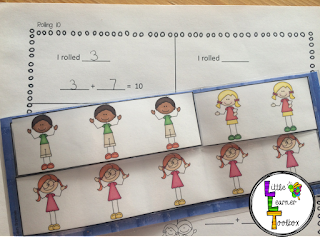 Ten frames are great for allowing students to visualize the numbers that make up ten and to explore those number bonds. 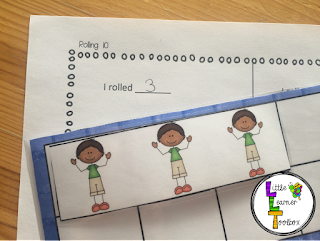 This 'Rolling 10 with Friends' activity, is a fun way to get your students 'hands on with the 10 frame. 1. Students roll a die. (The game has 2 dice that have the numbers from 1 - 9.) They record the number they roll on the recording sheet, and they make that number on the ten frame, using the 'Friends' number strips. 2. Students then use the student number strips to figure out how many more friends are needed to fill in the ten frame. Students could also count on, to figure out how many spaces are left on the ten frame first, before covering the remaining spaces with friends.